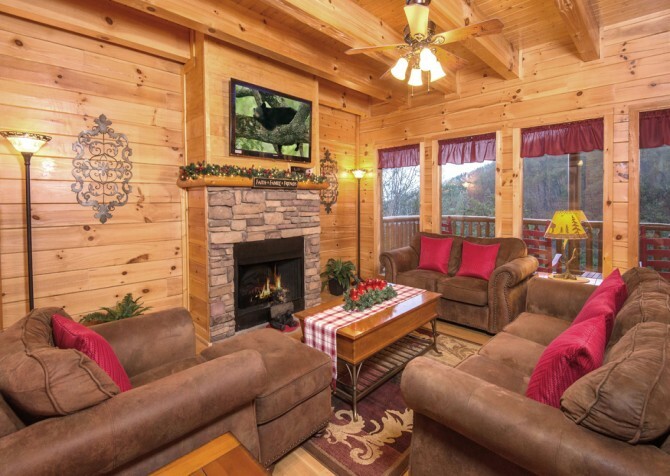 Boasting almost 3,000 square feet of space and room for up to 16 guests, this beautiful log cabin in Pigeon Forge is perfect for holiday getaways, family vacations, couples' retreats, and weekends with friends. Along with the fantastic views of the Smokies outside, the interiors of Be Our Guest feature tons of wonderful amenities. This 2-bedroom + loft, 4-bathroom cabin really lives up to its name, offering a welcoming atmosphere in every room of the house. Each space has been designed for form and function, from the spacious bedrooms with log furniture to the cozy living room with stone fireplace. 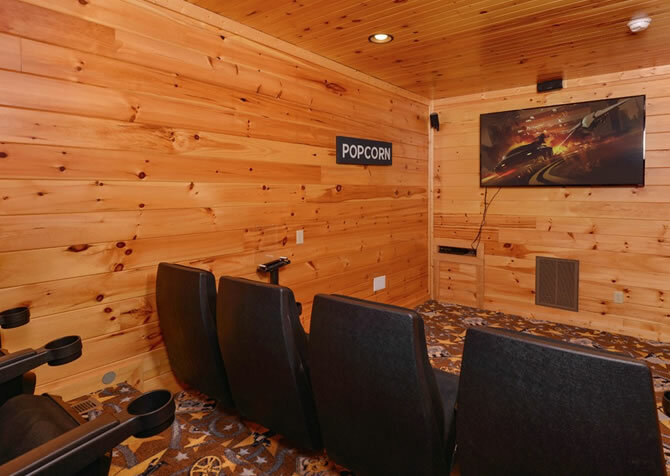 A rec room with a big screen TV and game tables provides plenty of in-cabin entertainment, and a fully equipped kitchen offers a space to create meals for the group. 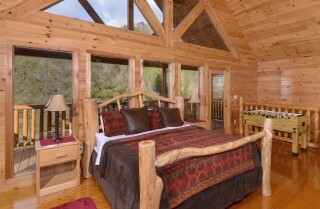 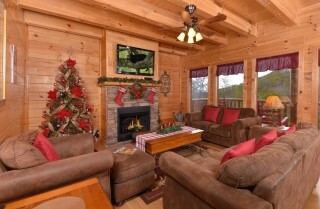 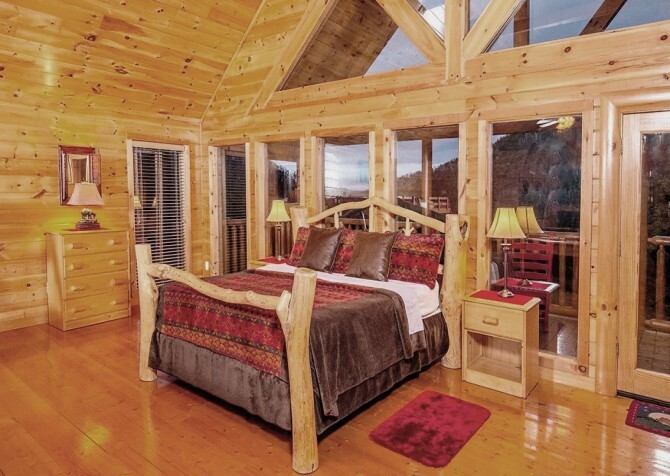 We invite you to Be Our Guest at this beautiful cabin in the Great Smoky Mountains! The living room of Be Our Guest is a homey space where you can relax and unwind. 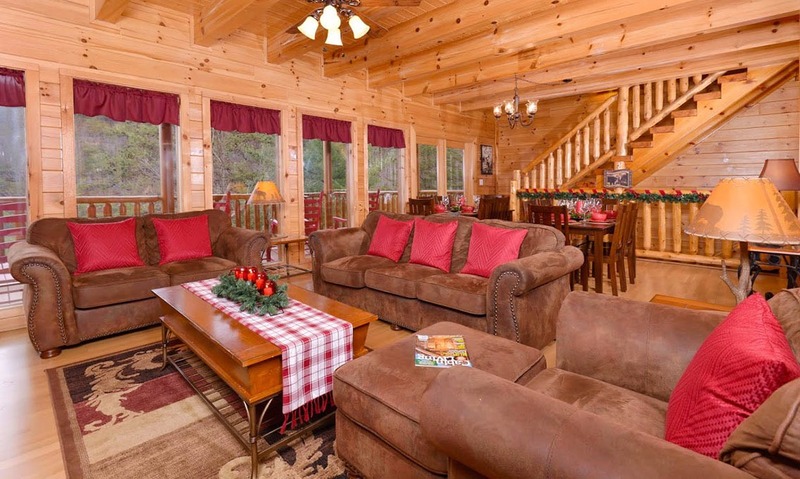 Furnished with comfortable sofas and chairs, a large area rug, and a coffee table big enough for snacks, drinks, card games, or board games, it's a room that invites you to sit down and stay a while. You can turn on the electric (heat) fireplace and enjoy a night in front of the fire on those cool evenings in the mountains, or you can just flip on the big screen TV and watch shows, movies, and ball games. Beautiful wood beams add to the cabin feel, and windows around the room frame the views. 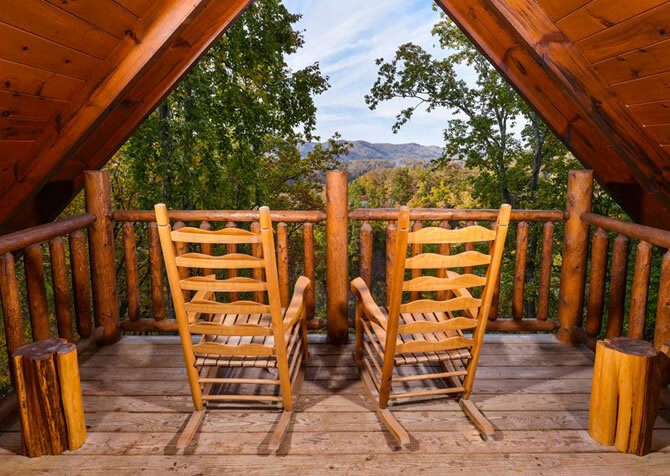 While you're here, take the opportunity to slow down a bit...enjoy being away from work, chores, and the busy pace of everyday life. 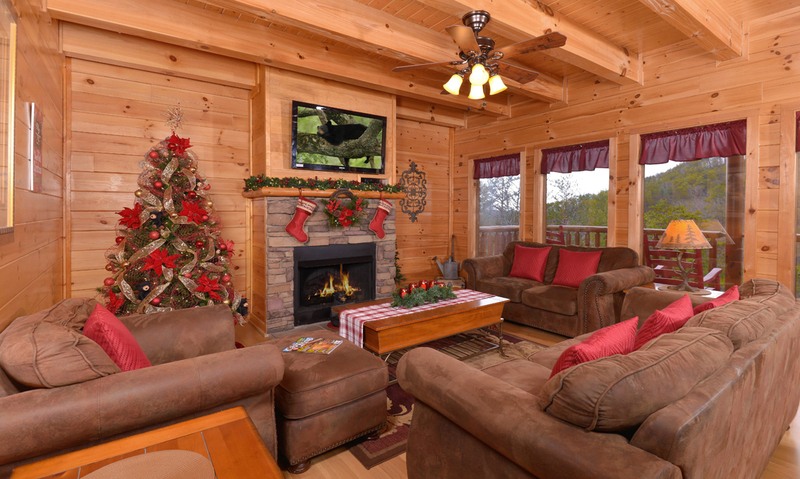 Gather here after a day of sightseeing to enjoy being with family and friends in the comfort of your own home away from home. 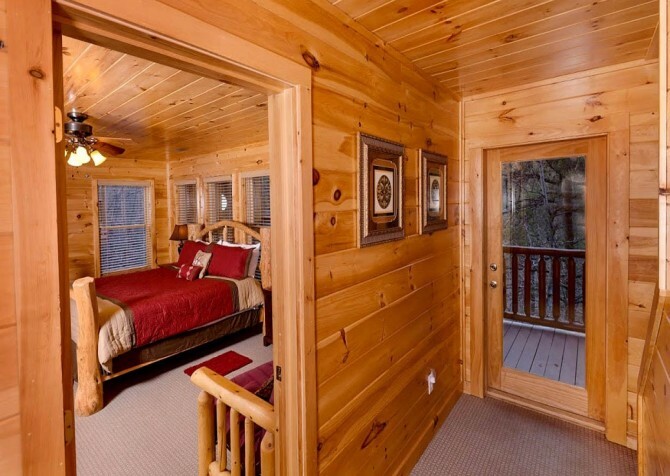 What a perfect escape! 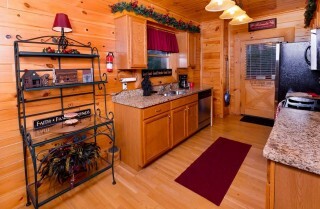 A cabin called Be Our Guest wouldn't be complete with a great place to create homemade meals. The kitchen here is fully equipped with all you need to make that happen. From dishes, utensils, and cooking tools to appliances, plenty of lighting, and ample counter space, Be Our Guest's kitchen is furnished with all the essentials. 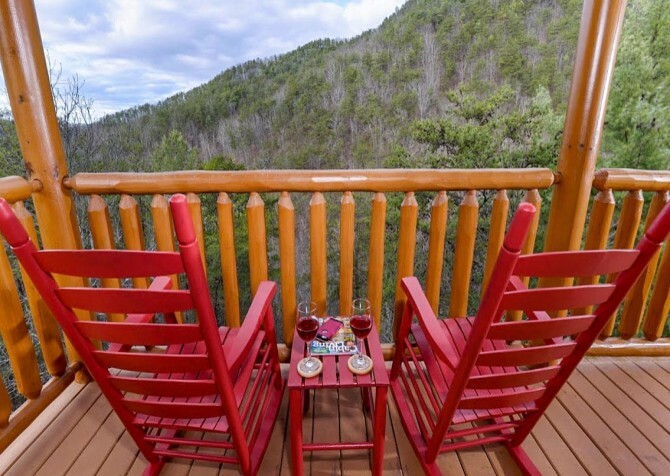 You can store drinks, leftovers, and snacks in the refrigerator, bake some cookies in the oven, fry some bacon on the stove, or just make some coffee to enjoy in front of the TV our outside on the deck. If you're not up for doing your own cooking, book an in-cabin chef to prepare, serve, and clean up after a delicious in-cabin meal! 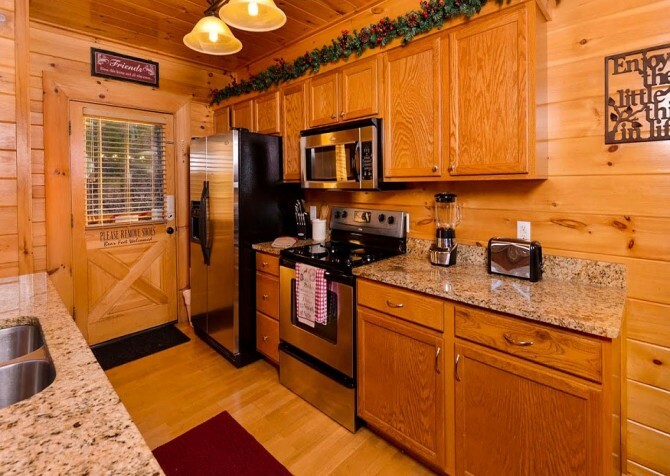 With stainless steel appliances and beautiful countertops, you’ll appreciate this lovely kitchen whether you do your own cooking or not. 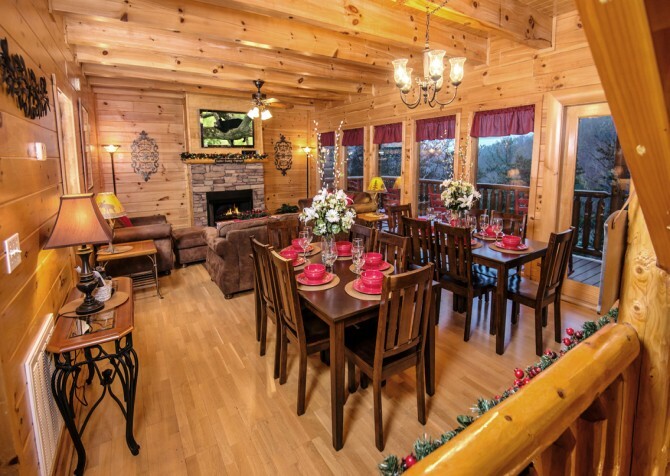 Be Our Guest offers several places for guests to dine. 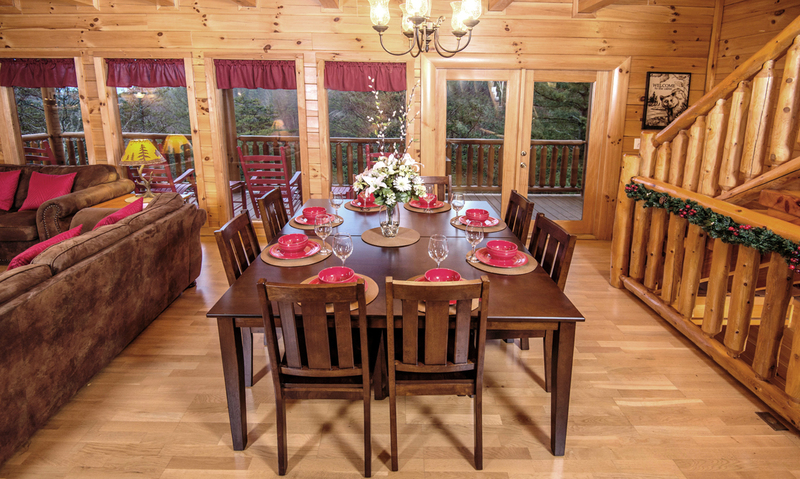 Two dining tables seat 6 each, while an additional folding table with 4 more chairs is located in the main floor bedroom. If you're preparing a meal for the whole group, you'll have enough seating for everyone to sit down for a peaceful meal at the same time. 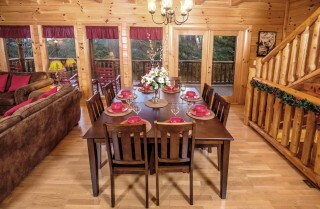 Or you can use the dining tables to set out buffet-style spreads for holidays and ball games. 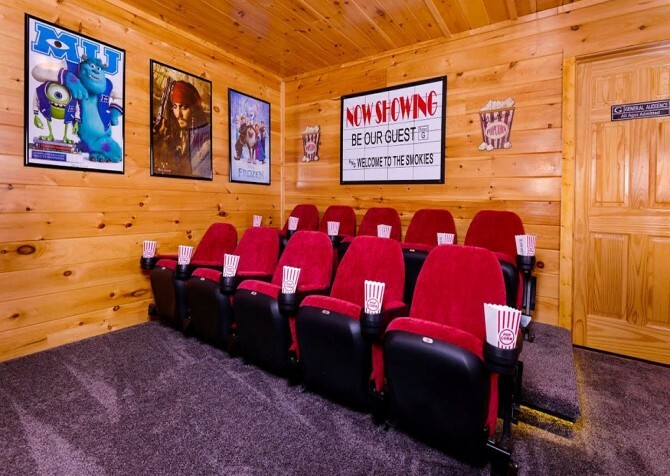 Open to the living room, the dining area is great for kids watching cartoons, playing a Christmas movie while enjoying a holiday meal, or watching a ball game and getting snacks at the same time! The large rec room of Be Our Guest is located upstairs, offering a fun place to hang out. 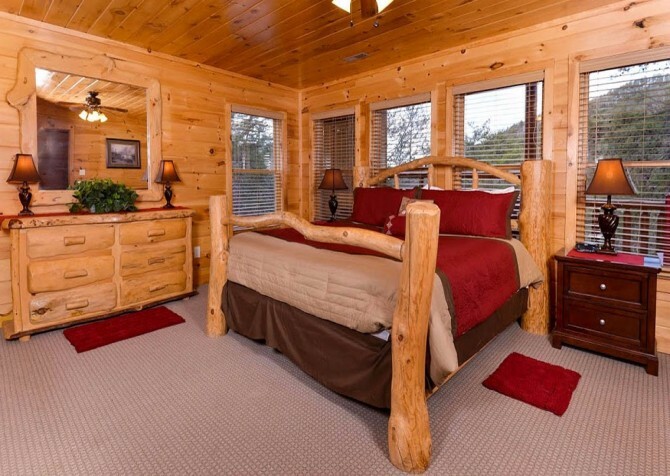 The spacious room features exposed wood beams and fans for those warmer days. From the youngest tots to the older adults, there is something for everyone here. 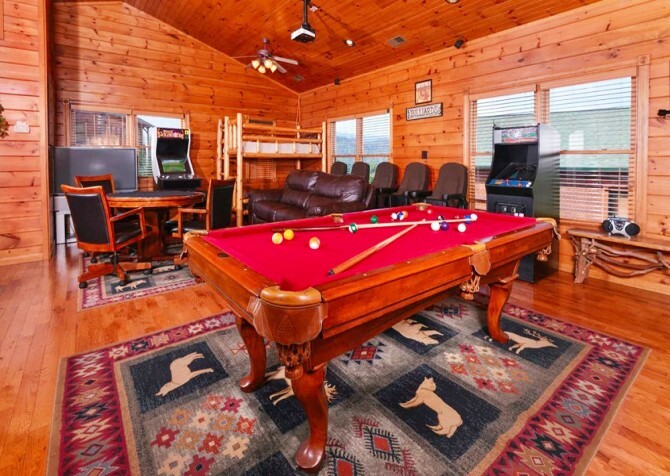 The little ones can crawl around on the large area rug while adults kick back in front of the big screen TV to watch a game or play a game on the Wii Game Console. 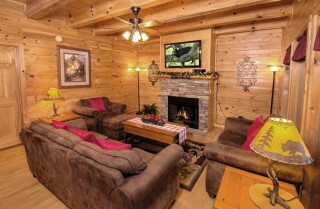 The two comfortable sofas here offer a place to take a break between games or even get in a quick afternoon nap. 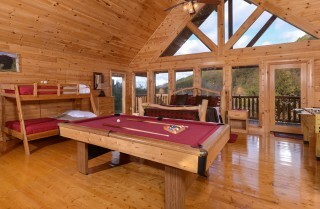 But of course, what's a rec room without game tables? 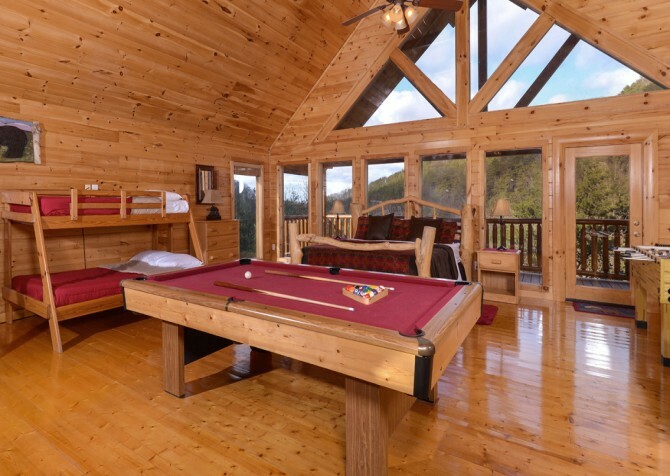 You'll have your pick here, with a foosball table and pool table. There is also a card table, so be sure to bring your favorite board games or a few decks to play with. Others can sit at the pub-style table and enjoy a drink. 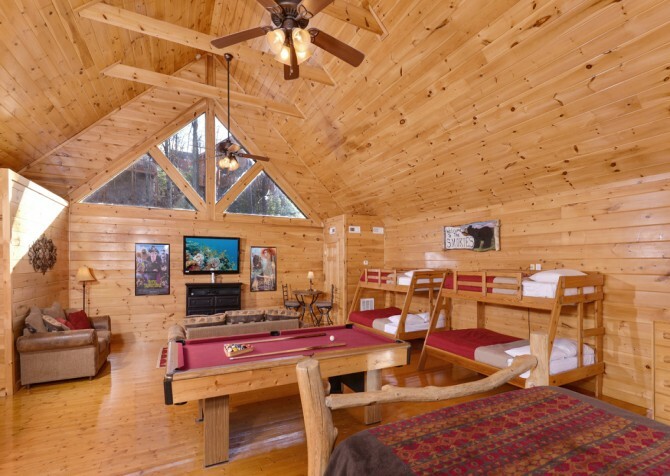 With so much space, all 16 guests can hang out here without feeling cramped. 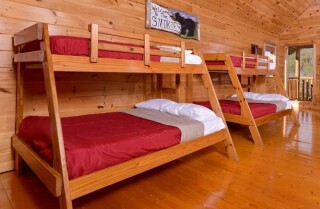 The rec room is also home to bunk beds, which is perfect for the kids. They will absolutely love having their own space and sleeping in the same place where they play! 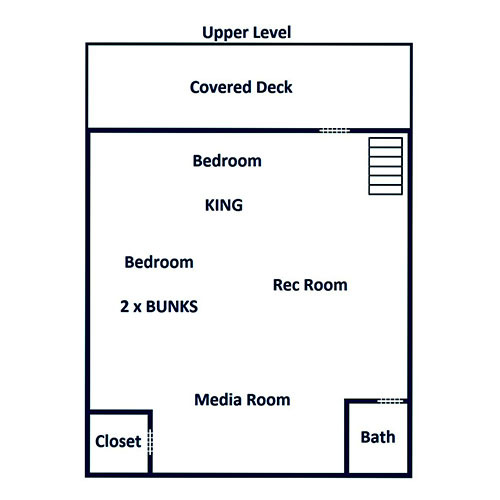 Along with an awesome rec room, Be Our Guest features a fantastic theater room with a 65" TV that both kids and adults will love. 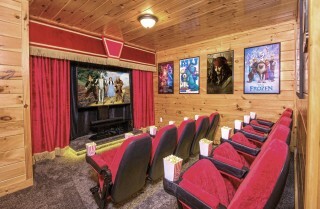 It offers theater-style seating for 10 guests, along with movie posters on the wall and a huge movie screen framed by classic rich red and gold-trimmed curtains. 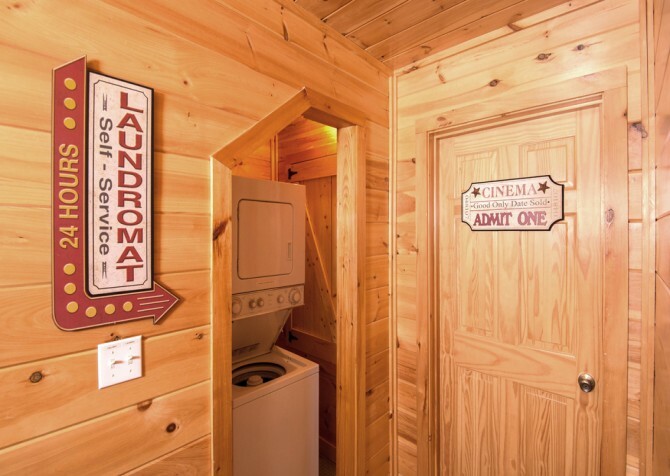 The chairs have cup holders, so you can have your favorite drink and pop some popcorn for an unforgettable movie night in the comfort and privacy of your own cabin. The bedrooms of Be Our Guest are spread across the cabin, offering some extra privacy for guests. Guests will have several options when it's time to call it a night, including 2 sets of twin-over-full bunk beds, 1 queen sleeper sofa, 3 king-size beds, and 1 queen-size futon in the basement. 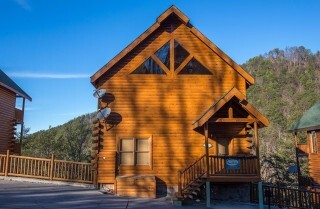 In all, there are sleeping accommodations for up to 16 guests, which is great for families, small groups, and several couples traveling together. 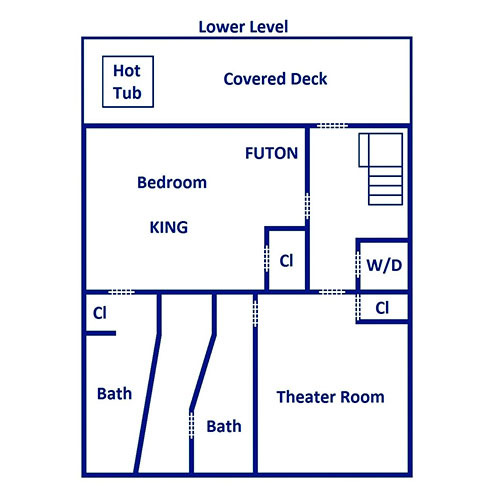 One bedroom even has its own jetted tub, which is ideal for refreshing baths to start the day or soothing soaks to end the night. 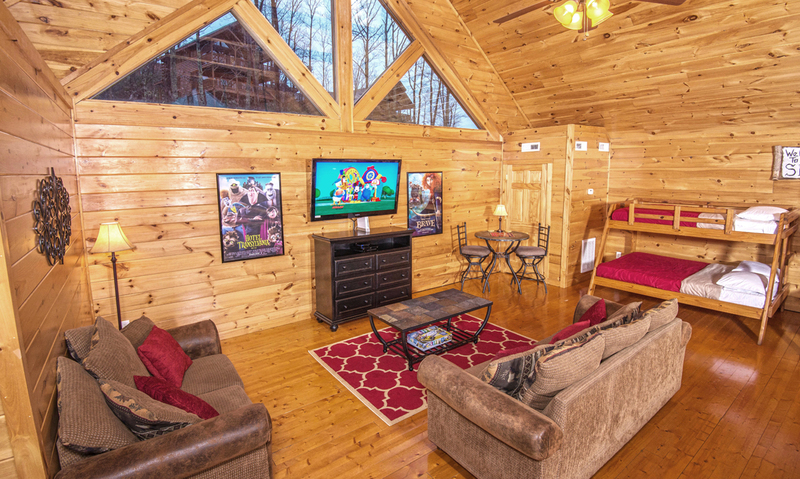 The bedrooms, as well as the loft, also have their own TVs, so every guest can enjoy a favorite late-night show before drifting off to sleep. 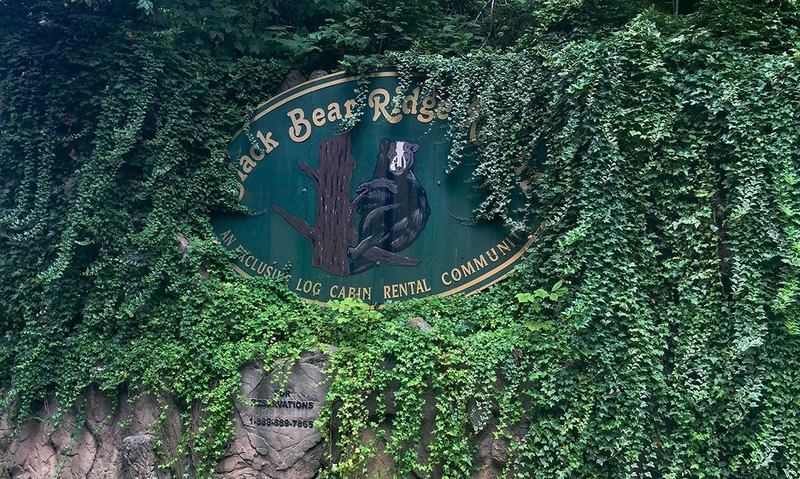 Be Our Guest offers several great outdoor spaces where you can get some fresh mountain air, enjoy the views, and take in the sounds and smells of the Great Smoky Mountains. When you need to stretch your legs, head out onto the decks and relax. 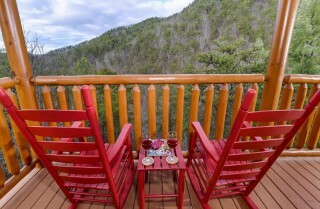 You can have a drink in the beautiful red rocking chairs, soak in the hot tub, or fire up the picnic area-style charcoal grill. 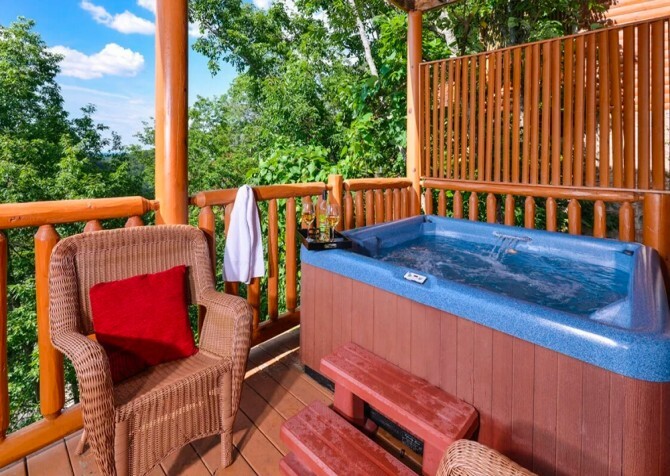 The hot tub offers mountain views, steps for easy entry, and hooks where you can hang your towel and quickly grab it on those really cold nights! 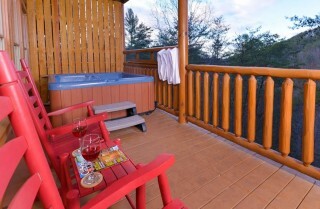 On the backside of the parking area, you'll find a nice wooded area that lends more privacy to the property. 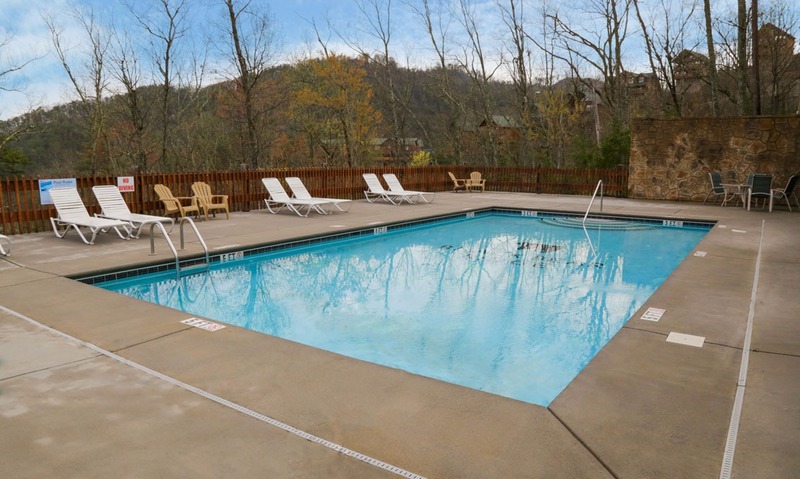 With a location in Black Bear Ridge Resort, Be Our Guest offers community pool access. At the cabin, you'll have a DVD player and Blu-ray player for those new releases or old favorites, high-speed wireless Internet for keeping up with what's happening in town, and a washer and dryer for getting clothes fresh after hikes in the Great Smoky Mountains National Park. And if you don't love the steep, winding roads of the mountains, enjoy the flat, paved driveway that makes for easy arrivals at this inviting Pigeon Forge cabin! At Be Our Guest, you'll get the best of both worlds, with the feel of a secluded cabin and the convenience of a property less than 5 minutes from Kroger and other shopping. When you don't want to fight the traffic, you'll have easy access to shops without ever getting on the Parkway! 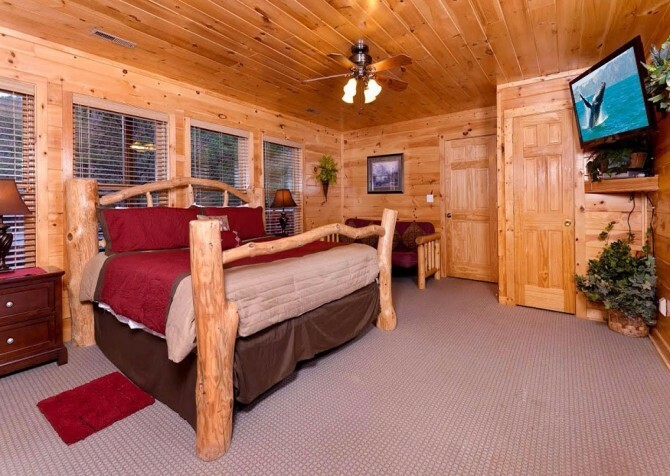 The cabin is also near 2 mountain coasters (just 3 miles away) on Wears Valley, horseback riding stables, and zip line companies. 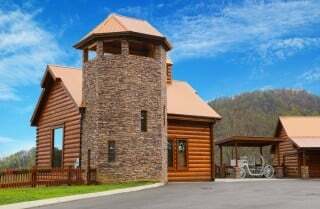 Of course, if you do want to see what the Parkway has to offer, you'll have lots of nearby options. Pigeon Forge offers tons of fun, including miniature golf courses, arcades, go kart tracks, outlet stores, local and chain restaurants, wineries and distilleries, and tons of family-friendly attractions. Be amazed at performers on horseback, doing amazing stunts and wearing dazzling costumes. 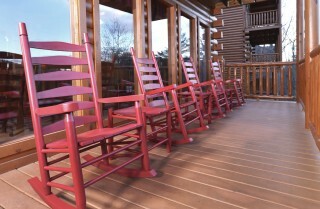 Along with your entertainment, enjoy a hearty 4-course meal, complete with Southern sweet tea, rolls, and dessert! 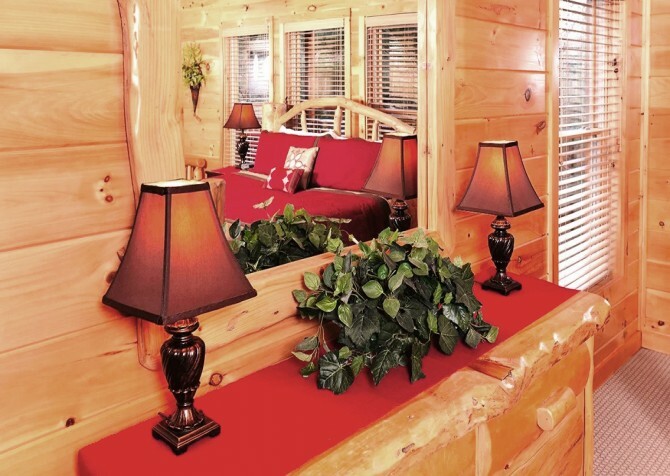 You could spend an entire day walking around at The Island in Pigeon Forge. 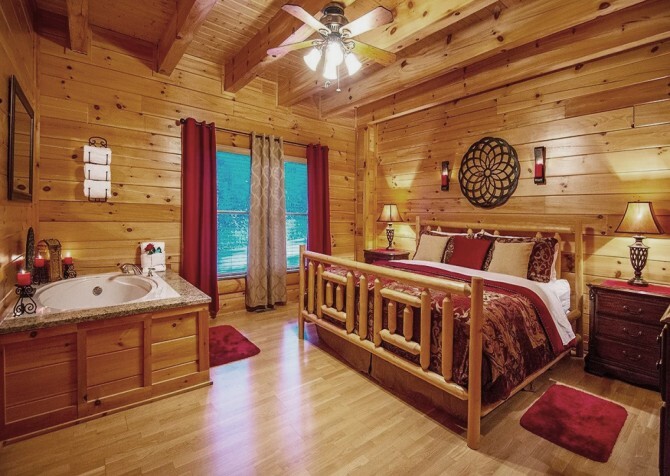 You can ride the 200-foot Great Smoky Mountain Wheel, taste moonshine at Ole Smoky Moonshine, pamper yourself at St. Somewhere Spa, let the kids make a friend at Build-A-Bear, or watch an incredible water and lights show at The Island Show Fountain! 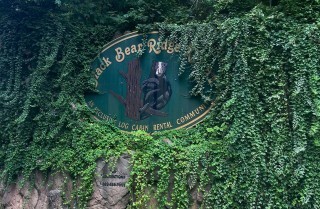 A little farther down the road, the most visited national park boasts hundreds of miles of trails to explore. You can hike, bike, go horseback riding, take a scenic drive, have a picnic, or take a relaxing walk to a beautiful waterfall. 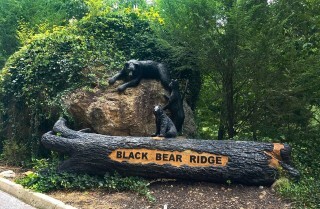 Admission to the park is free, and there are lots of fun kids’ activities throughout the year! "We loved the location and the cabin overall, our only complaint was the quality of the mattresses for the price point! We would definitely stay again!" 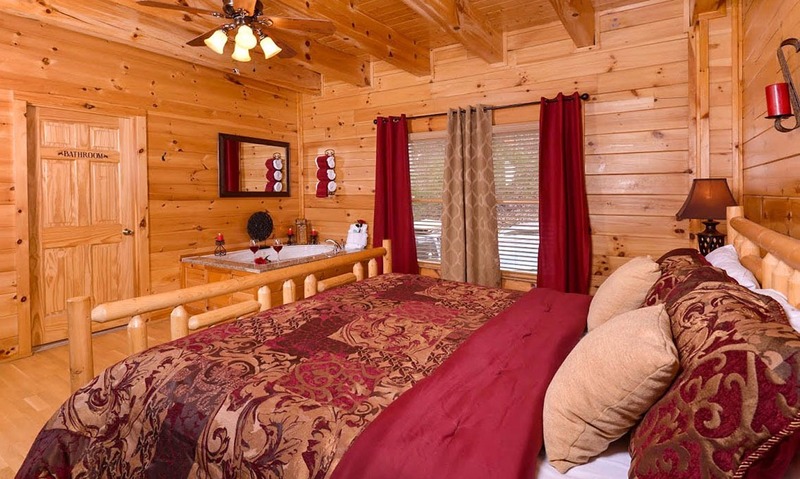 It's awesome to hear that you loved your cabin stay! 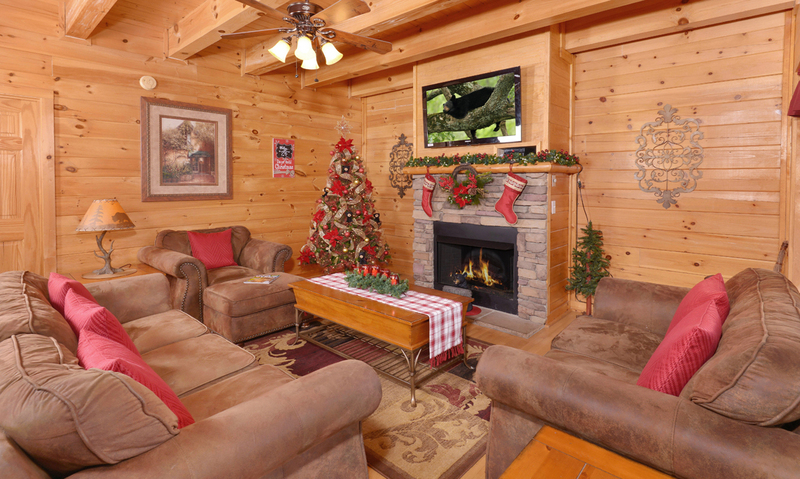 We will certainly pass your feedback along and appreciate it greatly. We look forward to serving you in the future! 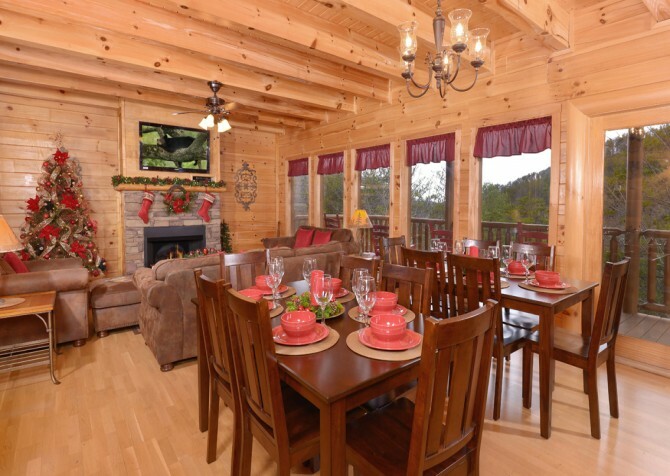 "A group of friends and myself rented the cabin Be Our Guest in February 2016, and we had a great experience. 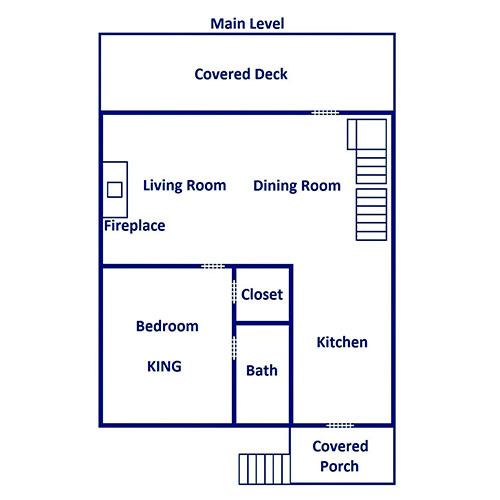 We were first time renters and had a great experience. Our dryer unit did not work at first, but after calling Cabins for You, a repair man came out right away and fixed it immediately. Our cabin was very clean, and we loved it. It was stocked with everything we needed. 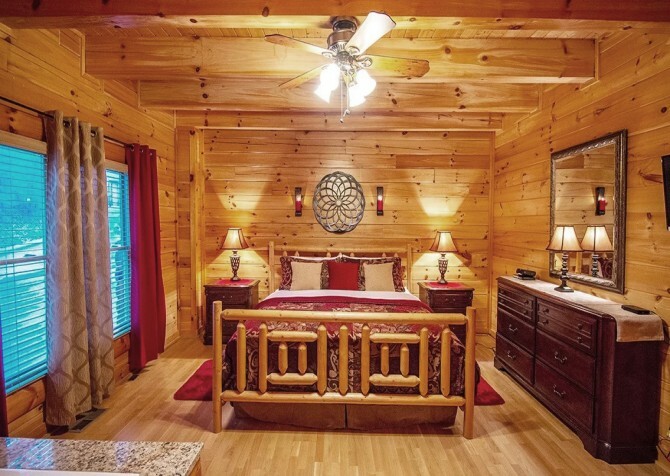 Due to this positive experience, my boyfriend and I have decided to rent another cabin, Abundant Romance, for the holiday season. Our vacation planner was very kind and helpful. We are very excited for our stay!" "Had a college soccer team get together here this weekend, it was a fantastic space to gather and see old friends."